After a long day at work you want to come home to a warming meal which is quick and delicious. Look no further! Grab your shopping list and get going! 1. Start by making the sauce and melt the butter and flour together over a medium heat to make a roux. When this is combined gradually add the milk and double cream- remember to keep stirring to avoid lumps but if you do spot a lump simply take the pan off the heat and stir until the lumps go. Simmer the sauce until it thickens before adding half of the parmesan, pesto and seasoning. 2. Heat a pan of water and cook the pasta until al dente before draining well and setting aside. The pasta will soften further in the oven when it bakes so don’t be tempted to over cook it now! In a frying pan heat a splash of oil and brown off the chicken pieces and a crushed clove of garlic. Add the asparagus tips and cook in the pan with the chicken until they start to soften. 3. Add the chicken mixture to the sauce base and pour over the pasta. The pasta needs to be put into an ovenproof baking dish and place the tomatoes into the pasta. Mix the remaining parmesan with the breadcrumbs and sprinkle over the top before baking at 180c/ 160 fan until golden and bubbling. You could also use mozzarella and parmesan as the topping if you prefer not to use breadcrumbs. I use panko breadcrumbs (a Japanese style crumb) as it gives a really crispy finish which you don’t always get with normal crumbs. Serve in warmed bowls with a simple side salad. Any leftovers will also make a delicious lunch the next day. Chicken, asparagus and pesto bake- a new favourite to add to your midweek meal list! 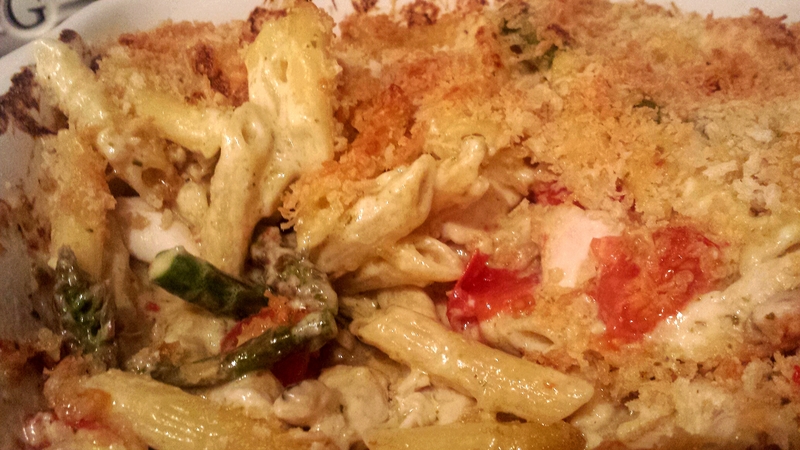 This entry was posted in Recipes and tagged asparagus, cherry tomatoes, panko, pasta bake by sotiris14. Bookmark the permalink.